Chris Marr is the founder of The Content Marketing Academy, the UK’s largest membership organisation of its type. He was the speaker at the February 2017 evening meeting of the Club. Chris is the leading voice of the growing content marketing movement in the UK. His pioneering work has helped countless organisations grow through content marketing. Like all educators, Chris is also a dedicated student. He’s interviewed and facilitated events with many of content marketing’s most notable thought leaders. 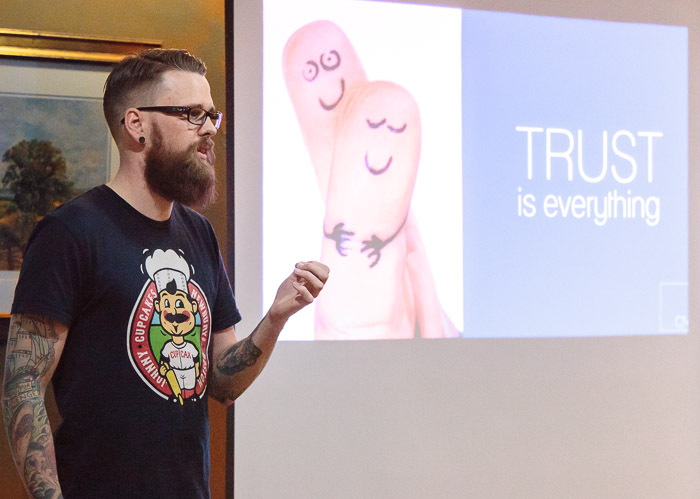 The knowledge he’s learned from the likes of Jay Baer, Ann Handley, Marcus Sheridan and Mark Schaefer has been shared freely with the members of his growing community. Chris told Club members and guests how to use content marketing to make their business stand out. Given the importance of trust, how do we communicate with digital consumers? Answer the questions they have! Why? Because 70% of buying decisions are made before the consumer contacts the retailer and if they contact you they’re close to buying. The Big 5 Questions to answer: 1) Prices; 2) Problems; 3) Comparisons of products; 4) Reviews; 5) What’s best? Don’t outsource your content marketing because it’s your source of competitive advantage! To replay the Facebook Live broadcast of Chris’s talk, click HERE. Members can request a copy of his slides by emailing the Club.